to the ROUSH Automotive Collection. August 10th, 2017 ROUSH Open House, Driver Autograph Session & Car Cruise-in! The Roush Automotive Collection is pleased to announce the third Open House event scheduled for the 2017 summer season to be held on Thursday, August 10th from 5:00 p.m. until 8:00 p.m. The first 200 people will receive a free Drawstring Bag! This event is free and open to the public. Activities planned for the Open House event include a Roush Fenway driver autograph session, car cruise-in, Roush Performance factory tours, drag race simulator, mustang pinball machine, door prize drawings, John Clor Mustang Design Presentations, and a Roush engine build competition. Note: This event is not the same week as the Woodward Dream Cruise due to the Roush Driver’s being in town the previous week for the Michigan International Speedway race. 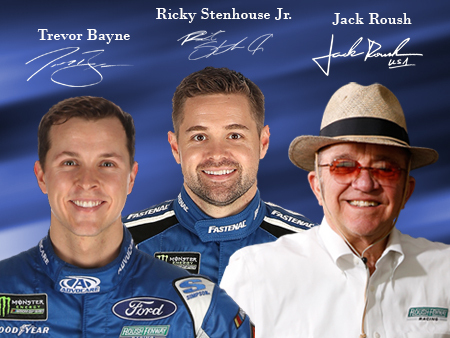 NASCAR Monster Energy Series race car drivers Ricky Stenhouse Jr. and Trevor Bayne, as well as, team owner Jack Roush will be on hand to meet fans and sign autographs from 5:30 pm until 7:00 pm. Autograph session times and appearances may be subject to change. Please call Event Hotline for details at 734-779-7276. Autograph session line procedures: Trevor Bayne, Ricky Stenhouse Jr., and Jack Roush will be in one line together. Limit 1 item per driver. Limit 1 item for Jack Roush. 150 wristbands will be passed out beginning at 4:30 pm to those in the autograph line. You MUST have a wristband to receive signatures however wristbands do not guarantee signatures. There is no cost for the wristbands or the autograph session. Line procedures may be subject to change. Car Cruisers are invited to bring their classic and special interest vehicles for display in our parking lot and all along Market Street in the designated areas from 4 pm – 8 pm. There is no pre-registration or charge for the car cruise-in and it is a rain or shine event. The Roush Automotive Collection Retail Store & Museum will be open from 9:30 am – 8:00 pm for your shopping needs and for free self-led tours. Come early & get what you need for the autograph session or to walk around the museum. A selection of authentic race car parts are available for purchase. A drag race simulator will also be available to test your reaction time. See if you have what it takes to be a drag racer. Try out our new Mustang pinball machine. 50 cents for 1 play and $1 for 3 plays. A series of door prize drawings are held throughout the evening. Drawings will be held at 6:30 pm and 7:30 pm. Door prize give-aways include a pair of MIS Grandstand seat tickets for the Pure Michigan 400 on August 13th 2017. Additional door prize give-aways include a variety of ROUSH Fenway memorabilia. Contestants must be present to win. One entry per person per night. Free to enter! Multiple entries in door prize drawing will lead to disqualification for all prizes. You've read his columns in Mustang magazines for years. You've seen him talk Mustangs in movies, videos and on TV. You may even own his limited-edition, sold-out hardcover book, "Mustang Dynasty.” Now - you can meet him IN PERSON! Acclaimed auto journalist and author John Clor, a former SVT PR man who today is the Enthusiast Communications Manager for Ford Performance, will be making a special appearance at our Open House. John will be giving a thirty-minute presentation on Mustang Design and will hold a special book-signing for his newest hardbound on the development of the current S550 Mustang, “Mustang 2015 – The New Generation.” During his Ford Performance Meet & Greet, he’ll also provide a giveaway for all who stop by. Don't miss this chance to meet and talk to one of Ford's most notable Mustang spokesmen at our Open House! Presentations will be held at 6:00 pm and 7:00 pm in the diner. Limited space is available. You must pre-register for these presentations by calling 734-779-7290.